Owen Chadwick, an eminent church historian, has written an original, sweeping history of the Christian faith from the perspective of a people's religion. A History of Christianity will be fascinating reading for anyone interested in one of the most powerful influences on global civilization. Starting with Christianity's origins as a Jewish sect, the author shows how Europe was converted; and then how the Christian faith was accepted by the Americas, much of Africa and parts of the East. He discusses the effects of the faith on the lives of believers throughout two millennia: the mutually uneasy relationship of the early Christians with the State; the rise of great monastic and clerical institutions, the different holy orders and their roles in disseminating the faith; Christ's imitators, and the canonization of exemplary Christians; the coming of the Protestants, and their attitudes towards work, worship and religious toleration; and Christianity's decline in Europe but expansion into the wider world, alongside twentieth-century issues such as the emancipation of women, birth control, Muslim fundamentalism, Nazi racism and Marxist atheism. In addition, he explains the evolution of the faith'sartistic expression: the development of ecclesiasticalarchitecture, from discreet house churches in the Roman age, via the soaring splendour of the Middle Ages, to the studios of the TV evangelists; the rituals, including theinterpretations of the sacred texts, vestments, and the rise development of ecclesiastical architecture. Eminent church historian Owen Chadwick has written this original, sweeping history of the Christian faith. Using layman's language, he surveys the lives of Christians over two millennia. A History of Christianity is essential reading for anyone interested in one of the most powerful influences on global civilization. Owen Chadwick was Regius Professor of Modern History at Cambridge from 1968 to 1983. He has written many books, including The Reformation, The Victorian Church, The Popes and European Revolution, as a result of which he was awarded the Wolfson Prize for history, and Michael Ramsey. "Graceful and vigorous . . . excellent. "—Commonwealth"A remarkable broad, comprehensive and well-balanced book . . . distinguished by a fabulous set of illustrations. "—Parade"Beautifully illustrated . 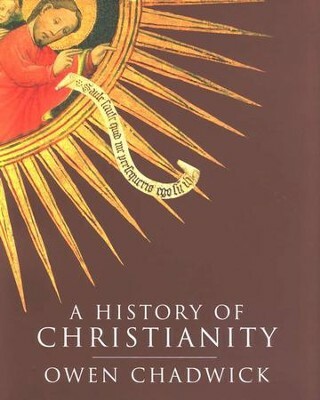 . . Chadwick's single-volume 'overview of the whole' of Christianity is so accessible it is sure to be in great demand. Regius Professor of Modern History at Cambridge University from 1968 to 1983, the author is among the most eminent of church historians; he notes that any attempt at 'an overview of the whole, by a single hand, is bound to contain an element of the personal, and the interest of a particular mind.' Both could be taken as weaknesses, but they are among the book's greatest strengths: a personal view, an overview from Cambridge—and, viewed in that light, a singularly instructive (and interesting) introduction to a particular mind in relation to the historical development of a global tradition. "—Booklist "The author infuses this history with a sense of the impact of Christianity on the lives and beliefs of ordinary men and women. In addition to tracing Christianity's origins as a Jewish sect, the history of its spread, and the growth of its institutions, he explains the evolution of the faith's artistic expression in architecture, painting, rituals, and music. He also discusses the Church's role in caring within the community—both medical and pastoral care—and its shifting attitudes to cruelty and war. The volume is abundantly illustrated with color and black and white reproductions and photos; and the author's integrated discussion of art, history, and beliefs gives it wide appeal to both scholars and general readers. "—Book News, Inc. I'm the author/artist and I want to review A History of Christianity.